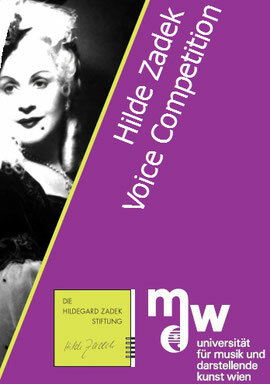 In 1999, the Hildegard Zadek Foundation initiated a biennial international vocal competition in order to promote the development of young singers. Since its inception the emphasis has been on contemporary music. The purposeful engagement with Modern Music requires a precise, concentrated and independent artistic and mindful analysis and interpretation of the present – of the here and now. The expectations of the participants’ artistry and technical abilities, even for the compulsory pieces, are very high. The above criteria presume a premeditated choice. In our experience this competition often serves as inspiration for many new compositions written especially for individual competitors. In this way, contemporary music is promoted in multiple ways! This unique competition was created because of our knowledge of the music industry, as well as our decades long experience of teaching young singers of many nations, and a sense of responsibility towards these young people. Seeing this need, the Hildegard Zadek foundation created this “special” singing competition. Winning this competition is not the only goal for our participants. It also presents them with an opportunity to measure their individual level of skills and ability and receive valuable feedback from prominent members of the field. The appointed jury offers insight to orientate the young artists and gives them support for their future endeavors. Dr.inBirgit MEYER (Director Opera Cologne), Walter KOBERA (Neue Oper Vienna), Mag.a Angelika MÖSER (Schönberg Center Vienna), Evamaria WIESER (Young Singers Project, Salzburg Festival), Thomas MITTERMAYER (Musikverein, Vienna) und Michaela DICKGIESSER (Senator E.H., Member of the Music Committee of the Kulturkreis der Dt. Wirtschaft Berlin). There are not only monetary prizes, but also prizes in the form of concert- and other opera engagements (for example in 2019: with the Opera of Cologne, Director Dr. Birgit Meyer, with the Neue Oper Wien, Walter Kobera, Gesellschaft der Musikfreunde (Society of Friends of Music), Thomas Mittermayr, Arnold Schönberg Center, Mag.Angelika Möser, the Young Singers Project Salzburg Festival, Eva Maria Wieser, among others). Talented students may also be supported through scholarships. Since 2002 the Hildegard Zadek Foundation has been working in close cooperation with the University of Music and Performing Arts of Vienna (mdw). The mdw generously supports the competition with a number of organizational activities, provides all necessary rooms during the competition days and together with the Hildegard Zadek Foundation, finances all costs for the Finale at the Gläserner Saal/Magna Auditorium of the Wiener Musikverein. The concept and spirit behind the competition are further supported by a host of individuals who work without compensation. The Hildegard Zadek Foundation works to build multi-faceted cooperative relationships and gratefully acknowledges the Musikverein in Vienna, where the Finalists´ Concert is held in its famous Glass Hall/Magna Auditorium. The financial means of the Universities in general, and the Hildegard Zadek Foundation specifically – are limited. We are therefore very grateful for, welcome and recognize all the sponsors who make the continuation of this project possible. Our primary goal is to fulfill our ethical obligations. We thank you!